Why does someone get ill, even though they exercise regularly and eat a healthy organic diet? Does the mind-body connection have any influence on our health? Soul Whisperer, Tony Mills is an expert in understanding the mind-body connection. He has gained a wealth of knowledge in this field and will be explaining how we can jeopardise our health and well-being by trying to ignore troubling emotions and feelings. For instance, What Really Causes Flu? Born and raised in north Wales, Tony Mills began working as a therapist over 30 years ago. 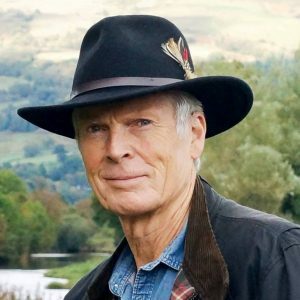 After learning various healing techniques, including massage, kinesiology and becoming a Reiki Master and Osteopath, Tony began to ask the question: What really causes ill health? What is the root cause of personal pain or discomfort? Tony became more and more interested in the mind-body connection. It was during this exploration, that he then realised he was a channel of Higher Energies and was being given information that finally led him to the work he does today. Energetic Wisdom is a holistic system for balancing, healing and harmonising all aspects of a person – body, mind, emotions and spirit. WILL YOU BE ONE OF OUR LUCKY VOLUNTEERS? 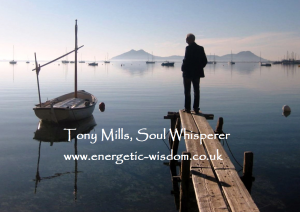 Soul Whisperer, Tony Mills gives talks about his work in various locations in the UK. 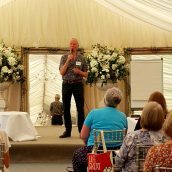 With the aid of volunteers from the audience, Tony will demonstrate Energetic Wisdom techniques in locating the root cause of what really causes ill health. Then, by using the Living Lens, Tony will demonstrate how this can often be quickly brought back into alignment. Using Energetic Wisdom techniques, a return to balance is often quickly achieved, making it one of the quickest and easiest forms of therapy around today. Tony will also channel energy through from his Spirit Guides and experiencing him at work can be very moving. Although Tony works at a very deep level, with his fun-loving and kind nature, each person will move through each process as lightly as possible. Energetic Wisdom and the Living Lens are like the ‘magic wand’ you had always wished for. and restore the system back to its full potential in a very short time. Tony Mills, reflecting on his joyful life. There are many aspects to how Tony assists his clients to health and well-being. These include harmonising chakras, meridians, miasms, and negative impacts of karmas or past lives. Hosted by the Nici Gorman of Dare To Be Well, which is a monthly event with various speakers. 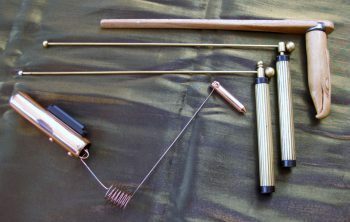 Some of the various dowsing tools that Tony uses in his work. Tony has two clinics in the New Forest, and also provides an online appointment service.